I’m trying to come up with more holiday oriented posts for the blog, especially ones that include homemade merchandise that isn’t too difficult or too expensive to make. Back during the Christmas holidays I shared a homemade wreath I made for our front door and at the time I made a note to myself that this could easily be done for other holidays. With that in mind, I loaded up on ornaments, especially shatterproof, at the after Christmas sales, all of today’s ornaments came from At Home. 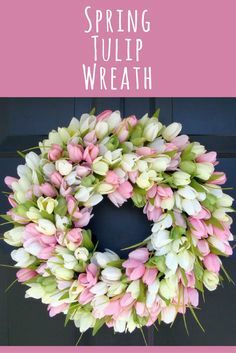 But, unfortunately, life and work got in the way and Valentine’s Day and St. Patrick’s Day passed by and I didn’t’ get the wreaths done that I wanted to so I promised myself that I would DEFINITELY do a wreath for Easter and I made it yesterday. 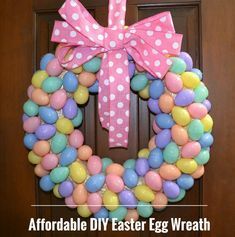 This really is an easy recipe to make this wreath, you need a wreath form, a spring colored garland to wrap the form, ornaments to hot glue to the garland and anything else you want to add for the holiday you’re doing, I used Easter eggs and chicks. For a step by step how to, you can revisit my Christmas Wreath post here and I’ve included some pictures of the finished product. Let me know what you think, I’m seriously thinking about making these to sell, thoughts? Enjoy!!! Here’s everything I used for the Easter wreath, the wreath form and ornaments are all from At Home that I picked up after Christmas. The garland, Easter eggs, and chicks were all from a craft store. The larger ornaments were pinks, purples, light blues, and greens. I also used some other green ornaments because green is such an easy color to work with. This tube had all the colors from the larger ornaments plus some white ornaments in a smaller size. I didn’t use the red but saved them for another project, this size ornament is great for filling in spaces. These eggs are styrofoam covered in a plastic glitter, they are lightweight and great for adding texture as well as letting us know what holiday this wreath is for. The chicks are also very light and cute. This garland was the most expensive thing I used, but I was able to buy it for 40% off. I loved all the colors which matched all the ornaments I had already bought. After I wrapped the wreath frame I thought that you could easily stop there and have a cute wreath, but no, we want AMAZING!!! Here’s the finished product on our front storm door, it came together really well and took me about 45 minutes from start to finish. One thing to remember when making a wreath, especially if you’re making it on a flat surface like I did, you need to hold it up and see how it looks when it’s vertical. Also, when attaching something like the chicks, remember they also need to be vertical or else they’ll look like they’re laying down. I used the styrofoam eggs to fill in spaces and add some depth to the wreath. They are so lightweight that they easily sit on top of the ornaments and scream EASTER!!! You can also use a wreath like this for a centerpiece. I placed it in the middle of our kitchen table and placed a bowl in the center filled with white ornaments and eggs matching the ones on the wreath. You could use this on your Easter buffet table, place a cake plate in the center with a beautiful Carrot Cake for dessert on the cake plate. One last look, I have to say this turned out better than I thought it was going to. I can’t wait to make more for other holidays and seasons. By Tab Byrum on April 4, 2017 .